Gifted and Special Needs - Science Explorers, Inc.
Science Explorers has the experience to adapt our lessons to the needs of the students...no matter of abilities. For over 20 years, Science Explorers has been working with our community partners to bring science to all students...children and adults...no matter of abilities. 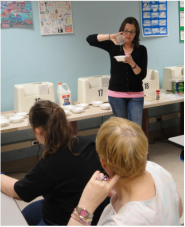 For students and adults with special needs, we provide a caring instructor and an adapted lesson. For students with high potential, Science Explorers has fun and challenging classes.